Commuting to and from Brooklyn and Manhattan is about to be a whole lot harder as the L Train prepares to close. Not all heroes wear capes. Or have human bodies. In fact, today’s unlikely source of inspiration comes from a canned-alcoholic beverage. The people of Brooklyn, New York, are saluting SpikedSeltzer’s gallant effort to help commuters get to Manhattan when the L Train closes down at the start of April 2019 (for a solid 15 months). From August 28 to 30, the brand will hand out bicycles to residents each evening during commuting hours of 5.30pm to 7.30pm. 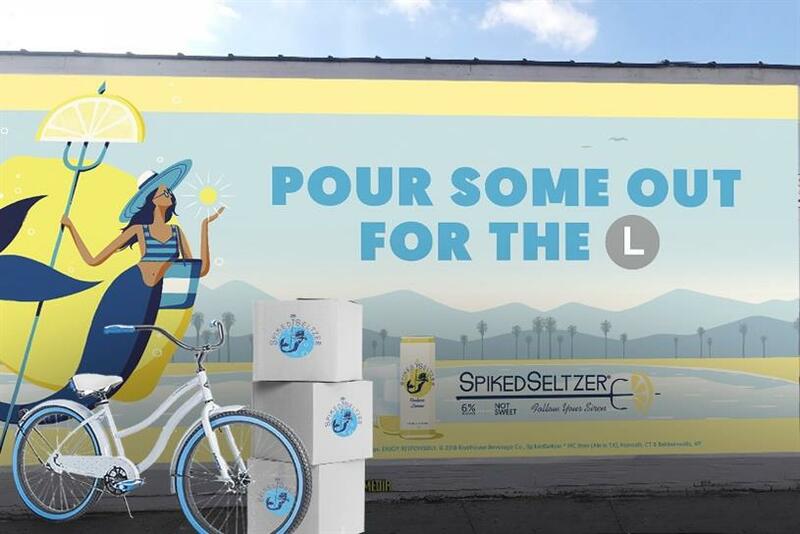 You can find SpikedSeltzer at 96 Wythe Ave., Brooklyn across the street from its "Pour Some Out For The L" billboard. Every night, the first 20 residents aged 21+ to show proof of Brooklyn residency will go home with a free two-wheeler. The OOH billboard was created by Bullish. The consumer promotion portion was created by 3PM -- a bespoke agency created specifically for Anheuser-Busch InBev by Weber Shandwick in partnership with PMK-BNC and Axis. "There’s no question that the impending shutdown has stirred anxiety in the borough," said Chelsea Phillips, vice president of Beyond Beer Brands at Anheuser-Busch. "As the Tri-State Area’s hard seltzer brand, we want to help ease locals’ L Train woes by giving them the initial tools they’ll need to stay or go." The closures have been in the diary for so long that some Brooklyn residents have planned to flee and move home. SpikedSeltzer has their back too. Those planning to forge a new path elsewhere can grab a complimentary moving box from the same location.